beacon bee: Summertime, and the living is easy. It has been a good summer for the bees, and if the saying "slow but steady wins the race" turns out to be true then they are in good shape. The new hive, the Flaming Maples, arrived strong, but small, and is still working to draw comb in the second box (the other boxes are due to my wishful thinking). The House Hive has a full super of honey on it, but I am not touching it until I know how much they have going into the winter. The bees look healthy and plentiful, but there was no spring harvest, no swarming, no bee covered hives on hot summer evenings. (See August of 2010 to see what I am referring to.) Why such a sluggish year? Maybe due to the long hard winter that we had followed by loads of rain that can wash valuable pollen off of the flowers. Maybe a sleepy queen. Every year is different, and I am doing what I can to make life a bit easier for the girls. A shot of the top of a box of frames. A shot of the bottom of a box of frames. 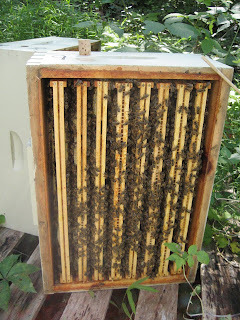 From this angle, I can peek up between the frames and see if comb has been drawn and if so, what is in it. I can also check the bottoms of the frames for queen cells. In this way, I am able to see a lot of what is going on before I even pull out a frame. August 20th marked the third annual National Honeybee Awareness Day! How did you celebrate? Vacationing 7,000 feet up in the air at Sequoia National Park, I had two terrific honeybee experiences while at a bbq. The first was communing with myriads of honeybees while meandering through an immense field of Goldenrod. When I returned to the tables of fellow tourists, Matt informed me that he had met a beekeeper. My pulse quickened! How many hives do you have? I asked (the equivalent of "how many kids do you have" in the bee world). "My husband has 2,800 hives." was the reply. Said husband is a commercial beekeeper in Southern California, and we had a great conversation that I had to be dragged away from. I've never spoken much with commercial beekeepers, and Larry did not seem to be annoyed by my barrage of questions. Such as how does a hive move through the year when there is no winter to shut down for? (The hive works year round, with the queen slowing down her egg production during periods when there is nothing to forage.) What do commercial beekeepers do with the tons of honey that the bees produce as they are shipped around to pollinate crops? (Nothing, it is used by the hives as they are divided. Bit of trivia: honey from almonds tastes horrible.) We talked a lot about various treatments for varroa mites (the downfall of many a hive these days) and I was heartened to learn that Larry has experimented (and had success) with using essential oils. This used to be considered a far out alternative treatment, kind of like eating garlic to cure bronchitis (which works by the way). But as beekeepers are finding more and more that conventional chemicals only work in the short term, they are becoming more willing to try other things, and low and behold, they work! Larry also said that he is paying more attention to the bees themselves, and is better able to notice how a hive is doing before things go bad. Preventative medicine versus cleaning up the mess afterwards. I must admit that my preconceived notions of commercial beekeepers had been less than positive; images of folks hurling hives around, dousing them with chemicals and high fructose corn syrup without regard or respect for the bees themselves, and Larry helped me to see past this. On our way out of the mountains, we were issued the strangest "bon voyage" by a roving group of honey bees. While stopped at a red light on a long sizzling hot road with endless groves of fruit trees, we suddenly became aware of insects flying around the car. Matt was the first to identify them as being honeybees, and I have never seen the girls behave in such a disorganized, random manner. Flying this way and that, spiraling, dipping and weaving around, over and around the car. I could sense their disorientation and can only figure that it was a recent delivery from a pollination truck that had not yet found its way back to its hive. The number of honeybee related blogs has become immense, but one that struck me especially worthy of note is this one, which features folks who sing and dance in honor of the fine Apis Mellifera. May the rest of your summer be as sweet as honey.